A randomised, double-blind study with the aim to test the efficacy and safety of Lactobacillus reuteri DSM 17938 (L. reuteri Protectis) in children with acute diarrhoea. Primary outcomes were the rate of unresolved diarrhoea after 3 days of treatment and duration of diarrhoea. Children (6-36 months), hospitalised in three paediatric hospitals in Southern Italy for acute diarrhoea with clinical signs of dehydration were randomised to receive in a double-blind fashion either Lactobacillus reuteri (dose of 4 × 10^8 colony-forming units/day) or placebo. Out of 96 eligible children, 74 were enrolled, five patients were withdrawn; 35 in the Lactobacillus reuteri group and 34 in the placebo group completed the study. 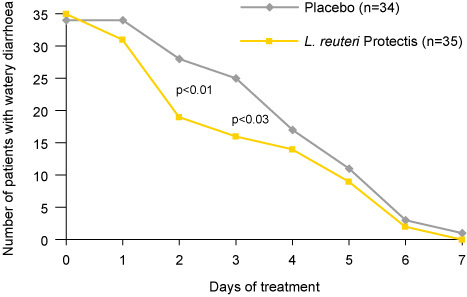 Lactobacillus reuteri significantly reduced the duration of watery diarrhoea as compared with placebo (2.1 ± 1.7 days vs. 3.3 ± 2.1 days; p<0.03); on day two and three of treatment watery diarrhoea persisted in 82% and 74% of the placebo and 55% and 45% of the Lactobacillus reuteri recipients respectively (p<0.01; p<0.03). Further, children receiving Lactobacillus reuteri Protectis had a significantly lower relapse rate of diarrhoea (15% vs. 42%; p<0.03). There was no significant difference in hospital stay between the groups. No adverse events were recorded. Conclusions: Lactobacillus reuteri Protectis, as an adjunct to rehydration therapy, was efficacious in the treatment of acute diarrhoea by reducing the frequency, duration and relapse rate of the disease.